As winter is nearing with each day, many of us desire a warm tropical destination. We are happy to present these popular all-inclusive resorts in Costa Rica. Enjoy a tropical getaway to Costa Rica and leave the cold weather behind. This Central American country has become a hot destination for travelers. It’s the perfect blend of natural beauty, rainforests and wildlife. In addition, make your vacation a memorable one. Stay at one of the popular all-inclusive resorts Costa Rica has to offer. On the northwest Pacific coast of Costa Rica lies Guanacaste. The region borders Nicaragua to the north and to the south, the Nicoya Peninsula. The scenic coast offers white-sand beaches, which are considered by many the best Costa Rica has to offer. Known for incredible wildlife, Costa Rica is ideal for nature lovers. The country is like an outdoor playground. Above all, you’ll find that about twenty-five precent of its land is preserved as national parks or conservation areas. Get out and take in nature at its best. Form tny hummingbirds that hover at hibiscus flowers, to howler monkeys that loudly bellow from the rainforest canopy treetops. Plus while you are laying poolside sipping on a cocktail, maybe an iconic iguana will be lounging nearby in the sun. Escape to this 5-star resort for a no-kids vacation. There, you can book an evening “moon and stars” spa treatment. Now that sounds devine. In addition, play tennis, snorkel or join a cooking or yoga class. Your dining options include 24-hour room service, the light and healthy cuisine of Aqua and Italian-inspired Portofino. Some suites even come with private plunge pools to relax and unwind. Between deep-green hills and the beach, the 5-star Hotel Riu Guanacaste has multiple dining venues and bars. You’ll also find a luxury spa and a fitness center. For extra pampering, choose a Jacuzzi suite with an ocean-view hot tub on the terrace. The Guanacaste province has several national preserves. For example, Riu’s staff can book an excursion to Rincon de la Vieja, home to hot springs, sloths and spider monkeys. The 169 rooms of this 4-star resort are spread across more than two dozen buildings. 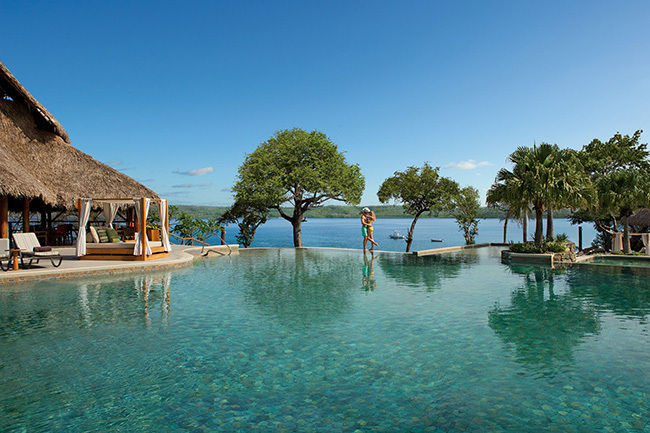 These are tucked into a lush hillside overlooking the sparkling blue Gulf of Papagayo. Resort guests can lounge by the pool surrounded by palms. Maybe get pampered and indulge in an outdoor massage. Also, you can go kayaking and sample several restaurants and bars. Lodging options include swimout suites with access to a river-like pool that winds through the 5-star property. The Explorer’s Club for ages 3 to 12 provides supervised activities. Included are a weekly beach campout, while Core Zone for ages 13 to 17 hosts social gatherings such as bonfires and dance mixers. Offsite excursions like ziplining and whitewater rafting can be arranged. This 5-star tropical retreat offers four swimming pools, a swim-up bar, gym, tennis, windsurfing, kayaking and snorkeling. Other perks include 24-hour room service and an in-room beverage station. The on-site dining scene is a combination of buffets and specialty restaurants. Furthermore, the dining options focus on Italian, Japanese and other cuisines. The Life of Luxury can help you plan and book your luxury vacation. Make you dream finally come true and take that magical vacation you deserve. Lastly, the upfront price for each resort includes accommodations, meals, beverages, entertainment, activities and nonmotorized water sports. Ready for the winter getaway to Costa Rica. Be sure to stay at one of these popular all-inclusive resorts. Stop by soon to follow our popular luxury blog.